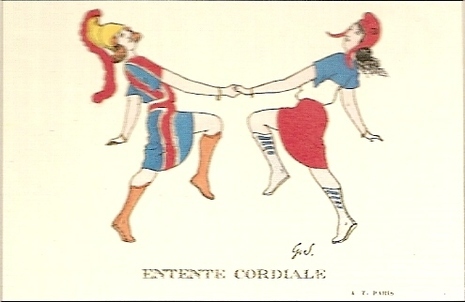 The Entente-cordiale is a series of agreements signed on 8 April 1904 between the United Kingdom and France. Beyond the immediate concerns of colonial expansion addressed by the agreement, the signing of the Entente cordiale marked the end of almost a millennium of intermittent conflict between the two nations and their predecessor states, and the start of a peaceful co-existence that has continued to date. The Entente cordiale, along with the Anglo-Russian Entente and the Franco-Russian Alliance, later became part of the Triple Entente among the UK, France, and Russia.